…you'll reach for this top time and again. The luxurious fabrics and raw-edged georgette trim detailing are ideal for special occasions. The relaxed T-shirt shape looks great paired with jeans for your just-popping-to-the-pub look. The hard part? Choosing between the silk velvet and sequin options. 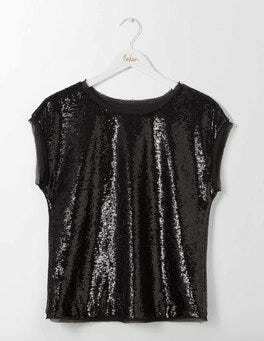 We like to think of this sparkly jersey tee as a magic trick you can wear. Simply brush your hand over the sequins to reveal a new hue. 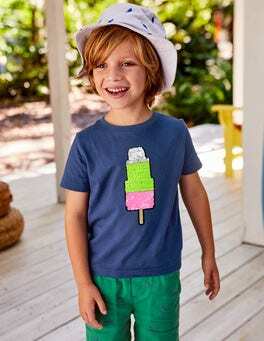 The striped soft jersey is the perfect background for eating cherries or ice lollies. 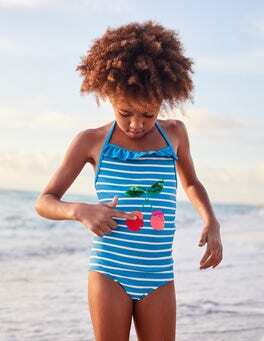 The cleverest wizards have been working very hard on this swimsuit. To see their magic at work, move a hand across the design on the front and it'll change colour. 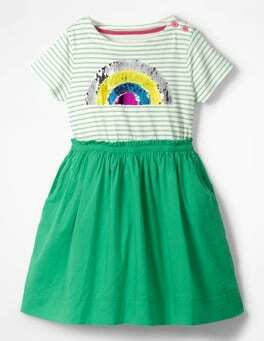 Playful stripes and fun frills add to the fairy-tale fun. Sunlight and sequins = a perfect combination. 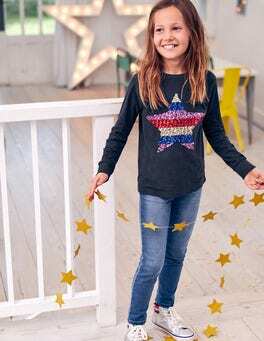 This breezy top is decorated with twinkly stars or shimmering strawberries that shine brightly in the light. The machine-washable slub cotton means it's easy to make the sparkle last. 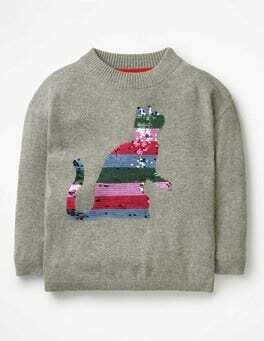 This super-duper jumper is just begging to be jumped into headfirst. 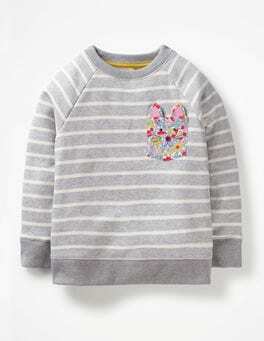 Put together using a supersoft cotton-merino-wool blend, it has a chunky ribbed neckline and contrast cuffs. Motifs range from tip-top life advice in rainbow shades to magical colour-changing sequins. …if the cosy brush-back cotton-rich material wasn't enough, we injected a touch of magic into this sweatshirt. Wave a hand over the sparkly stars, rainbows or bright sequinned stripes and – hey, presto – they change colour in a flash. But the greatest trick of all? It's all totally machine washable. Is that a giant disco ball? Oh, wait – it’s just our party-ready playsuit. 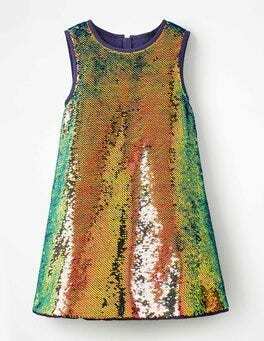 Prepare for some serious disco fever with the multi-coloured sequins adorning the cotton voile fabric. A hidden zip down the front makes it easy to wriggle out of when it’s time to hang up those dancing shoes. 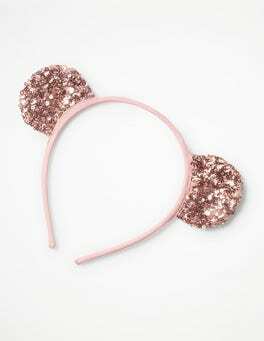 Our fun, sequin headband is just the thing for listening out for magical creatures. In dusty pink cotton, it has glittering 3D ears to help with the search – shhh, don't tell everyone, or they'll all want a turn. This fun jersey playsuit has 'Christmas party' written all over it – in invisible ink, of course. 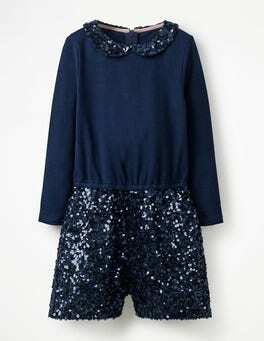 We added a million (okay, maybe we lost count) sequins to the shorts, and a few more to the Peter Pan collar too. The zipped back makes it easy to be disco-ready in seconds. 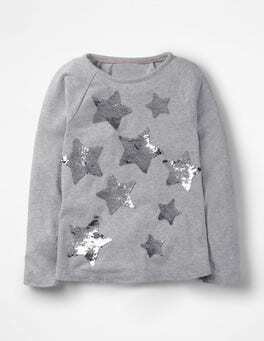 Our sparkling sequin top is definitely ready for a certain special occasion – but there are no tricks here, just treats. 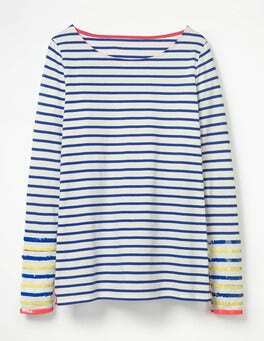 The long-sleeved T-shirt has a striped body decorated with an embellished design. We've added sporty raglan sleeves and a contrasting neck trim to make it extra fun. It's time to shine on the sports field – no training necessary. Simply rub the sequins on our heavyweight raglan jersey to reveal a new colour. Tactics this slick win every time, whether on or off the pitch. Ready, set, sparkle. 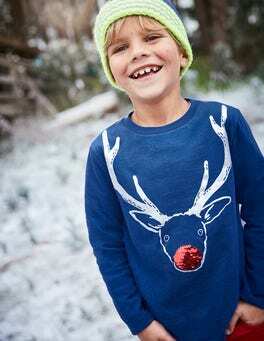 Christmas is a magical time and this soft, cotton T-shirt is no exception with its festive foil print. 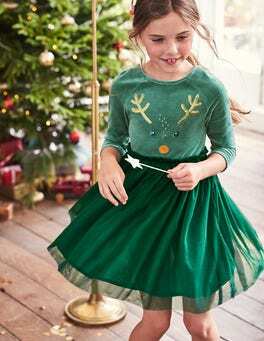 Wave a hand across the sequins, say the magic word (hint: it's the name of everyone's favourite reindeer) and ta-da, the colours change – no wand required. What's better for quests, stars or sequins? We couldn't decide either, so we put them both on this T-shirt. 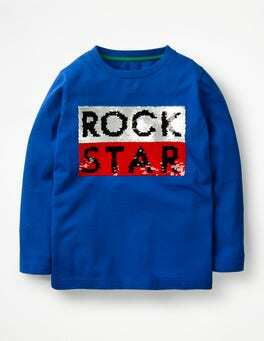 Made from soft cotton jersey, it has sporty raglan sleeves – so adventurers will be comfortable all day long. Now, where's the start of that trail? 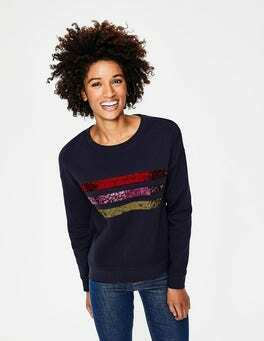 This Merino-cashmere knit storms in with shimmering sequins to light up even the darkest of wardrobes. Just a quick swipe of the hand will change their colour to match the day's mood. The ribbed cuffs and neck make it cosy too. 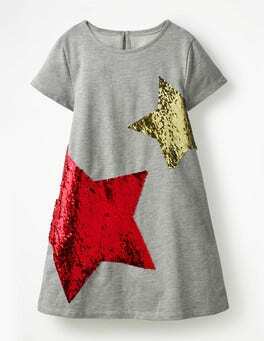 Go galactic with glitter in our extra-special party dress. We’re talking seriously sparkly sequins on top, and a velvet skirt that’s out-of-this-world soft. The hidden zip at the back comes in handy when it’s time for take-off. 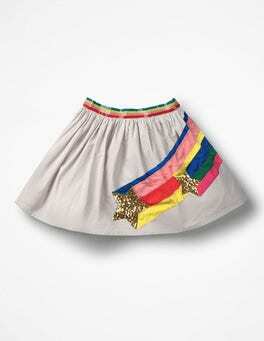 Make way for our rainbow-powered skirt. With shiny sequins and bright swooshes, it's ready to twirl across any room. We've added a soft cotton voile lining so it's super light and airy too. This dress wins gold in the wintry comfort stakes. We think it has something to do with the 100% cotton material. 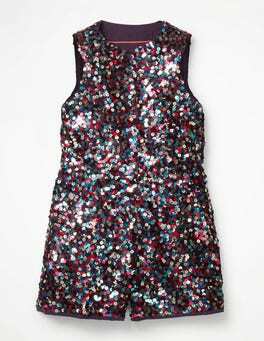 And forget about wearing hearts on sleeves – this one shines out from the front, made with enough sequins to rival a disco ball. Shine like a star in our fully lined dress. Bright colours and a removable bow create the perfect party outfit set to impress. Sequinned spots create a twinkling rainbow and the tulle petticoat is made for spinning around the dance floor. Calling all animal lovers – the sequinned creatures on this soft jersey dress are just waiting to be taken to a party. They sit above the printed skirt. Functional buttons at the back mean less time spent dressing, more time having fun. There's only one way to improve sequins and that's to have them change colour. Well, here's some good news: the ones on this jersey day dress do just that. 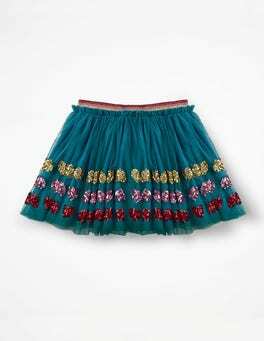 We've teamed them with flutter sleeves and a contrasting tiered skirt. Prepare to sparkle all through the day. This fruity flutter appliqué design is just right for summer fun, with bold stripes and sparkly sequins to make the most of the sunshine. Breathable cotton makes playtime comfortable, and the tie straps aren't just pretty – they're secure enough to withstand even the most active holiday adventures. …make our Bretons even more perfect if we tried. We were wrong. 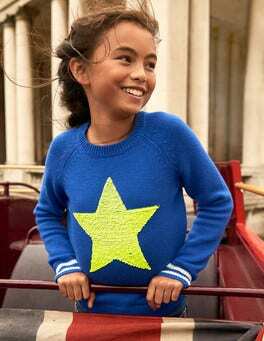 This update on a classic has all the features you’ve come to expect – supersoft 100% cotton jersey, the perfect length, stripes that actually line up – but we’ve added grosgrain trims, sequins and embroidery to make it REALLY special. We’re seeing sequins with this fun-loving skirt. 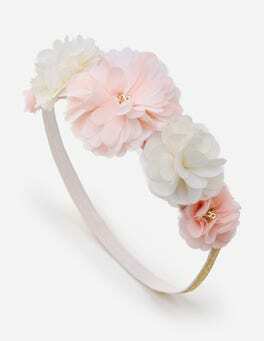 Made with tulle for extra fullness, it’s also got a cotton lining for softness and comfort. Talking of comfort, the elasticated waistband makes it easy to show off those moves on the dance floor. Swish, swish! 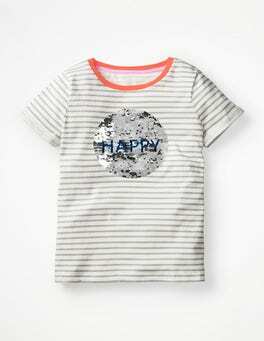 Put on a happy face (or two) in this cheerful striped T-shirt. The sequinned smiley transforms into a friendly message with a magical swipe of the hand. Fully machine washable, it's easy to keep the sparkle coming time after time. What do cotton tops do during winter? They have a super-sparkly seasonal makeover, that's what. The centrepiece is the fun, festive motif, which is outlined with a satin stitch. Wave a hand over the design to see the sequins change colour. It's even machine washable – now, that's what we call magic. …nothing – trust us) that isn't better with sparkle. 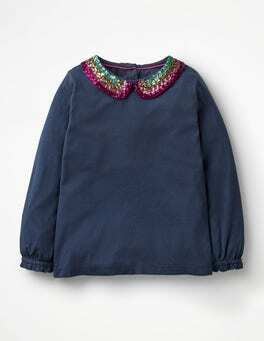 This casual top, made from soft-as-snow cotton, has long sleeves and elasticated cuffs to keep out the chill. 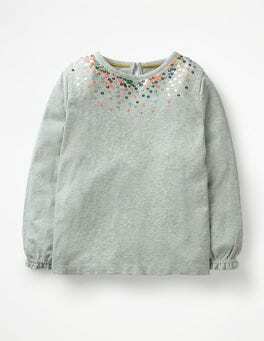 But simple doesn't mean dull: we added a scattering of twinkly-as-can-be sequins around the yoke to make this a park-to-party piece. When is a T-shirt more than a T-shirt? When we add printed graphics with sparkly details to the front, then pop on some sleeve frills for good measure. It's eye-catching, but with a relaxed fit in 100% cotton jersey, it's comfortable and easy to wear too. What do you get when frills meet thrills? This twinkly top. To go with the sparkly, jersey fabric, it has flouncy double ruffles on the shoulders. They're embellished with contrasting sequins for added shimmer. Prepare to out-gleam, out-glimmer and out-glint everyone else at the party. …getting active, hanging out with friends or cosy days at home. They're brushed inside for softness, elasticated at the cuffs and waist, and finished with a drawstring for comfort. Oh, and we almost forgot the colourful detailing, sequins and flock details. We predict these will be a real winner. When action calls, grab our star-studded bomber jacket before flying out the door. This design has a quilted disco-themed print on the inside and loopback cotton shell on the outside to keep things oh-so toasty. Pops of colour on the cuffs, hem and collar take the style stakes sky high. …no doubt that cats know how to party. We've added a gold sequin-embroidered kitty's face to this dress, which has a velvet body and a lined tulle skirt. Its 3D ears make it almost too cute (just joking – there's no such thing). For festive fun, pick the reindeer with the dazzling sequin antlers. What better way to get into the spirit of the season than with a snowman necklace? We've pulled out all the Christmassy stops and given this design a bobble hat, sparkly gold details and a ribbon tie. It comes with its own bag too, making it a present Father Christmas would approve of. 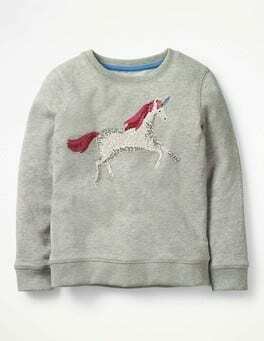 Of course unicorns exist, just look at this super-sparkly one on our sweatshirt. In cotton loopback fabric and a relaxed shape, this jumper is soft and comfortable. The sequin embellishment brings a touch of magic to every day. Going from playground to birthday party? All in a day's work for this dress. It's made from comfortable cotton jersey and has sporty raglan sleeves – perfect for getting active. 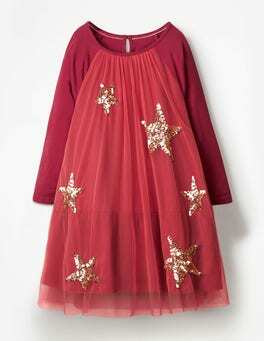 The tulle layer with sparkly sequin stars makes it as big a hit on the dance floor as it is on the climbing frame. This casual dress was made for windy walks in the woods. Comfort is top of the priority list – we’re talking a sweatshirt top in brush-back cotton. A woven check skirt brings cheer, while a silver sequin pocket adds all-day sparkle. Just add woolly tights (and some more glitter, for good measure). …that we're huge fans of classics with a twist. Take this cotton shirt for example – in bold colourblocks, playful prints AND for the first time... sequin embellishment. Tailored to a semi-fitted shape, this party-starter is still smart enough for the office – it's the best way to mix work and play. Add a tropical twist to your outfit with these statement parrot earrings. 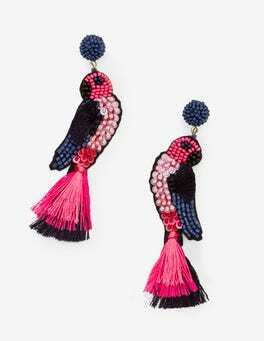 These hand-beaded beauties feature colourful sequins and tassels for an exotic feel. Complete the look with an embroidered kaftan and sandals (palm trees optional). These all-action trousers are versatile enough for, well, anything. The comfortable woven fabric, elasticated waist and easy-to-wear colours are ready for outdoor adventures. With sequins down the seam, they're right at home under the disco lights too. 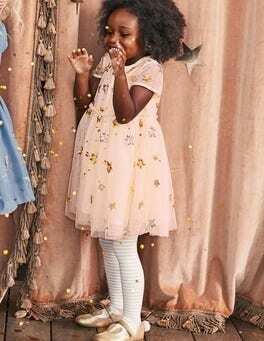 With three scallop-edged tiers of lightweight cotton decorated by embroidery, sequins and beads, the fluttery ra-ra skirt of this dress will send any mini fairy soaring with glee. The elasticated waist has a grosgrain tie to keep it snug and comfortable for whatever flights of fancy are in store. Move over, Cinderella. 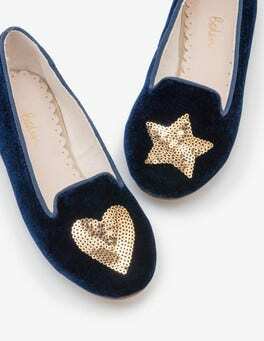 In these embellished slippers, little toes will feel special all evening long. Sequins add a magic touch to dancing feet, while the lush velvet uppers and a soft canvas lining mean they're as comfortable as they are shiny. Win-win, if you ask us. Say hello to the prettiest high tops in town. Choose from metallic silver leather or navy suede with sequins and get ready to add a bit of magic and sparkle to outdoor adventures. The two-in-one design means you can practise tying your shoelaces or simply use the side zips if you're in a hurry. Our cotton-rich velvet trousers are always ready for a party – can you see why? Yes, those are sparkling, colourful sequins on the back pockets. We've added more pockets on the front and given the fabric a little stretch – perfect for twisting into those super-cool dance moves. …cuffs and neckline. She’s fully lined and falls gracefully against your shape in a cut that flatters in all the right places. The notch neck design adds a modern twist and styles perfectly with a statement pendant and oversized earrings. Burnished gold sequins around the hem sparkle on sunny days. 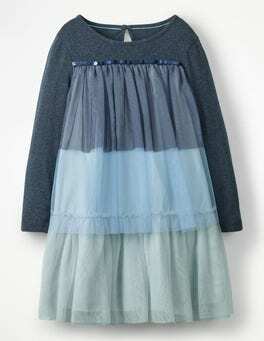 A bit like wearing a cloud (probably), this velour dress with gently gathered cuffs is wonderfully soft and cosy. And we haven't even got to the best bit yet: the bodice is decorated with two sequin-coated frills, which continue onto the back. Who needs tinsel anyway?